When you're going to have a baby, it's like planning a fabulous vacation trip - to Italy. You buy a bunch of guidebooks and make your wonderful plans. The Colosseum. The Michelangelo’s David. The gondolas in Venice. You may learn some handy phrases in Italian. It's all very exciting. Raising a child who has cerebral palsy creates fresh challenges for the whole family. Research indicates a household with a special needs child is more prone to depression, suicide, financial strain, relationship challenges, divorce, and bankruptcy. Others will boast that it can bring relationships together with purpose. Embracing a life with cerebral palsy requires planning, organisation, perspective, adaptation, and inspiration. For parents, a review of their child’s care plan provides a chronology of choices they’ve made, steps they’ve taken, learning they’ve experienced, and a glimpse at their hopes and dreams for tomorrow; a true source of pride and accomplishment. 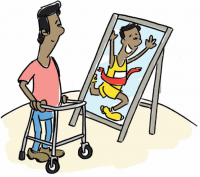 Many learn how to embrace a life with cerebral palsy somewhere inside the journey itself. Who will marry my child? What role can they play in society/church/mosque? There are many support groups within communities for children and their families who have cerebral palsy. They can be parent associations, or parent support groups, or self help groups. Being a member of a support group can be a huge support for the caregivers.In low resource places such groups often look for income generation activities for their members as well. Identify parent groups, disability groups or Disabled People Organisations in your own local area and country. Refer parents/caregivers to such groups and also as professional work together with these groups. Example of impact of a parent group: In rural Tanzania parents of children with a disability could get a goat in order to improve their economic situation. They had to build their own shed for the goat(s) AND they had to form a parent group in order to help each other with this activity. The parents decided themselves to also ensure that the child with the disability of a group member would be well cared for by the family and if the child was neglected by the family that family could no longer participate in the income generation programme and the goat would be taken away. The result was not only improved economic situation but also empowered parents who tried to find solutions together for their children. As the CBR worker said: "work has become easier for me, because the parents first try to find among themselves solutions for their problems. Before they were member of the group they always asked me to solve the problems of their child. I only now realize how much skills and resources the parents have together".